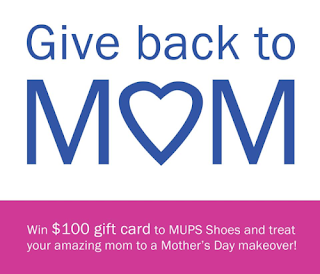 MUPS Shoes is giving you the chance to win a $100 gift card to MUPS Shoes to surprise your mom with! What Mom doesn't love shoes? Well, even if she doesn't love shoes...who couldn't use a new pair?! Enter to win on the MUPS Shoes Facebook Page. Contest ends at 12:00 A.M. on May 12, 2013. Must be 18+ years of age to enter. Winner will be notified via email and given 48 hours to respond before a new winner is picked. Facebook is in no way affiliated with this giveaway.